Square Flagstone - Legends Landscape Supply Inc.
Flagstone is a wonderfully versatile hardscaping product that will improve the curb appeal of any property. Square cut flagstone, with the beautiful colour variations found in the stone and the precise, straight lines made by human hands, creates an appearance that is natural and unnatural; unique and eye-catching. Just because Mother Nature avoids straight lines doesn’t mean you have to. Square cut doesn’t refer to a standard size or shape of cut, only straight lines with right angles at each corner. 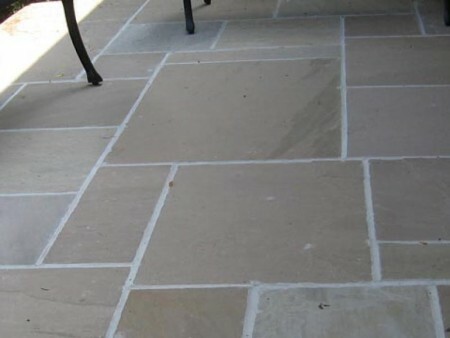 A patio can look neat and clean with large, square stones of equal size throughout. It can look slightly more unique if a series of rectangles are introduced to change up the appearance of the joints. And a full mixture of large and small square and rectangle stones can look interesting without becoming the center of attention. Flagstone can be laid using two methods. The pieces are set permanently with a mortar to a prepared base. The base can be properly graded cement (to ensure drainage) or compacted gravel (ideally, this will be compaction tested by an engineering firm to ensure longevity). This is recommended for high traffic areas to avoid stone movement over time. Sand and/or gravel form the base of dry-laid flagstone. This is the more affordable option, and while stones may shift slightly over time, there are techniques and materials (like polymeric sand) that can reduce this phenomenon. If you’re looking for some one on one consultation time, give us a call and we’ll happily connect you with one of our experienced landscape estimators today.